Hello to you all from a very wind-battered and storm ridden Argyll! In fact, as I write this, the snow is lying a few inches on the ground and a blizzard has been blowing for the last five hours. Since the middle of December we've had just about every kind of weather imaginable but fortunately they knew how to build houses 300 years ago and we have survived yet again without a scratch. Some of our garden plants are looking a bit the worse for wear but once I get out there among them - when the weather behaves! - they'll be fine. This is a great area for gardens. The Gulf Stream meanders its way up the loch and many of our foreign visitors are stunned by some of the plants which survive and thrive around here. In our own garden we have a lovely young Eucalyptus tree and Fuschias abound, to name but two. I'm afraid I am not a particularly serious gardener, if I like the look of a plant I try to give it a home and so far most of what I plant grows. But for those of you who take it a little more seriously, just twelve miles south of the cottage is the very famous Younger Botanical Gardens at Benmore. The first thing to strike you as you walk thru' the gates is the avenue of Giant Redwoods - that's my mum in the 'photo to give you some perspective. 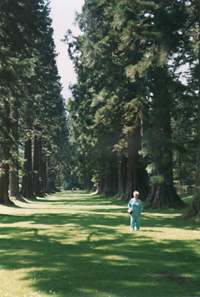 These were planted by the American, Piers Patrick, when he owned Benmore Estate from 1862 to 1870. The next owner - James Duncan - planted a total of six and a half million trees and began the tradition of rhododendron cultivation. The last private owner was H G Younger and in 1928 he presented the whole estate to the nation. Most of the acreage and almost all the hill ground went to the Forestry Commission. About 120 acres were gifted to the Royal Botanic Garden in Edinburgh and these now form the Younger Botanic Garden. Although the main work of these gardens is research, especially with rhododendrons and conifers, during the open season (April - October) visitors are encouraged to wonder for hours among the exotic and not so exotic plants which clothe the estate.